Rosa damascena (Family: Rosaceae) is thought to be native of Middle East. Recent genetic test indicate that a more probable origin is the foothills of central Asia. Rosa × damascena, more commonly known as the Damask rose, or sometimes as the Rose of Castile, is a rose hybrid, derived from Rosa gallica and Rosa moschata. The ﬂowering in R. bourboniana is sporadic and it ﬂowers three times a year. 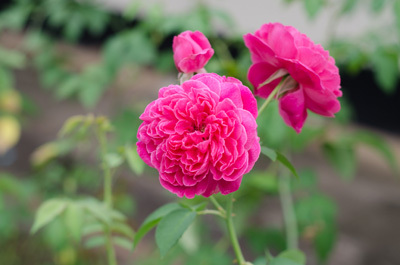 The Damask rose is a deciduous shrub growing to 2.2 metres (7 ft 3 in) tall, the stems densely armed with stout, curved prickles and stiff bristles. The leaves are pinnate, with five (rarely seven) leaflets. The roses are a light to moderate pink to light red. The relatively small flowers grow in groups. The bush has an informal shape. It is considered an important type of Old Rose, and also important for its prominent place in the pedigree of many other types.